On Oct 3rd we travelled by train from Monterosso to Pisa, left our cases at the railway station, raced across town to see the tower, you know the one, the tower, stopping for lunch along the way, then raced back across town to pick up a rental car in the hopes of being able to drive to our villetta on a farm in Tuscany and arrive before dark. Which we did. Just. And with the help of yet another Italian angel in human form. 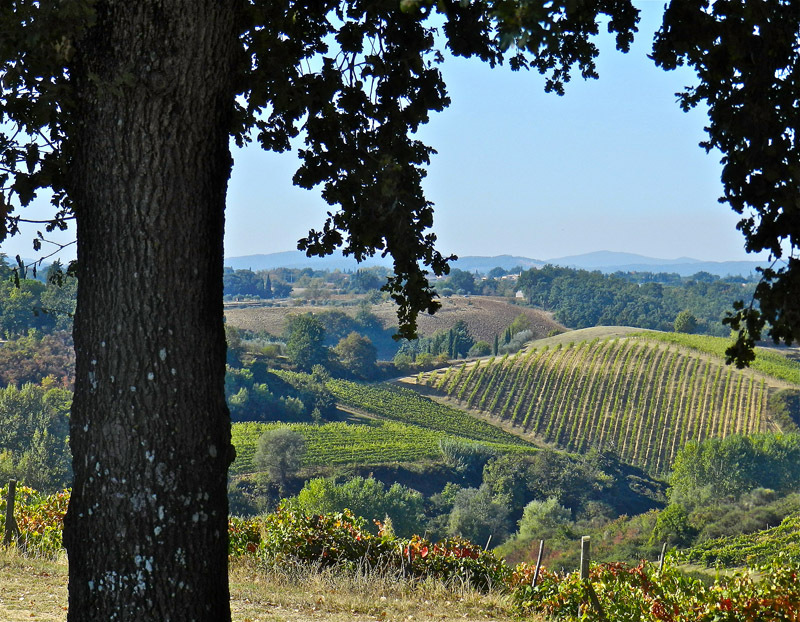 We knew the farm where we were staying was near Poggibonsi, but that was about it. We had some google directions that were just wrong wrong wrong. And to top it all I had a day off as far as organization is concerned. I left my passport locked in my case at the railway station so couldn’t sign on as a second driver when we rented the car, and I’d completely misplaced Matteo’s phone number, the one person at the farm who could speak English and who could help us. 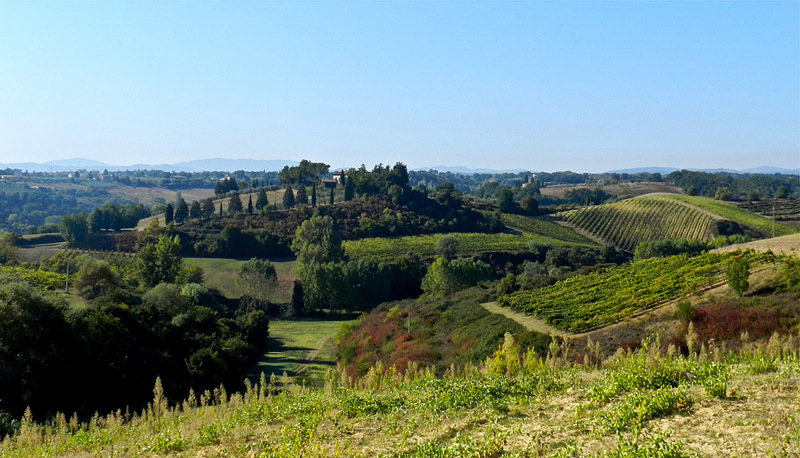 So we drove around in increasing anxiety and desperation, driving south to Colle Val D’Elsa because it looked like it might be the right way given the completely indecipherable directions I’d gotten from the farm website. In the meantime Ruth is convinced we should be back in Poggibonsi because the google directions were giving directions of making turns only metres from the highway. 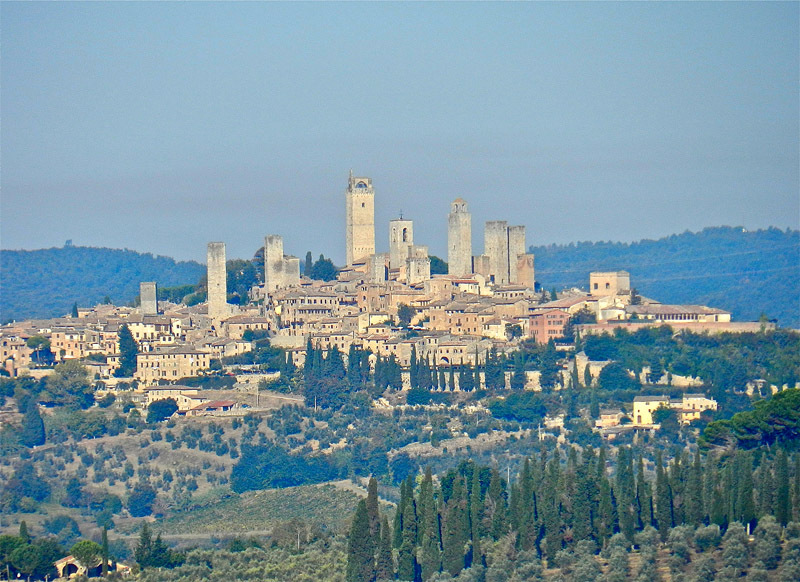 Which I knew had to be wrong because I knew the farm was only about six km from San Gimignano, and Poggibonsi is about twelve km from San Gimignano. 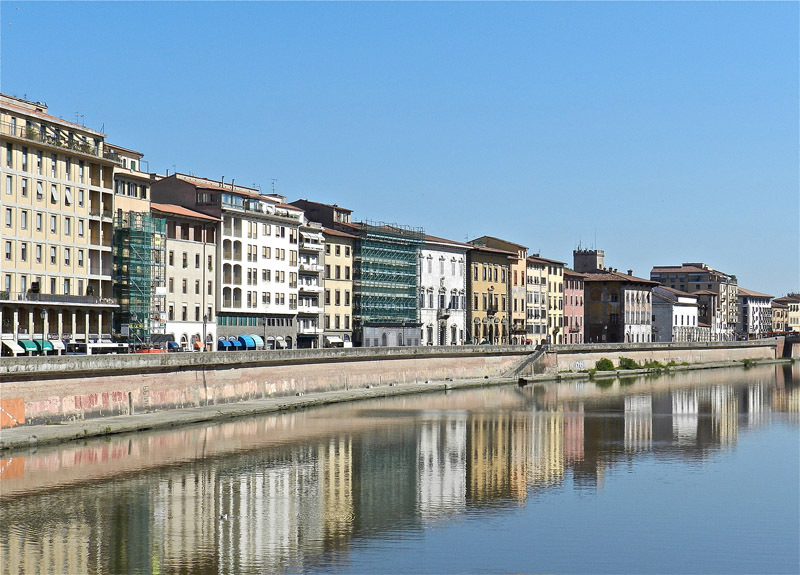 It didn’t help that the google directions were from leaving the Sienna-Firenze highway, and we’d come from Certaldo! Is this making any sense yet? Anyway finally we stopped at a café/gas station. We sent Ruth, because she’s braver than we are, to approach a group of men who were sitting outside playing cards, who understood enough to get another guy to help, who decided the delivery guy, who was at the gas pumps with his truck, for sure would know. Anyway in the end thank God for google because at the end of their otherwise completely useless and utterly confusing directions there was a phone number that we called, and one of the men who’d been helping us had a long conversation in Italian with Franco at the farm, who speaks no English, as we later found out. And then offered to take us there! Wow! So Lucky. We would never have found it otherwise. We followed him in his little red car for about 30 minutes over a very complex route and finally up a dirt road for a long way, until eventually he stopped, conferred with a farmer that our place “Podere Il Pino” was just a kilometer up the road, and then with hand shakes and smiles all round, left us to continue on. We didn’t even have a bottle of wine to give him. A few days later I found Matteo’s phone number buried at the bottom of my case. I also found out, when we finally met Matteo, that if we’d called him from Poggibonsi he would have sent Franco to get us. 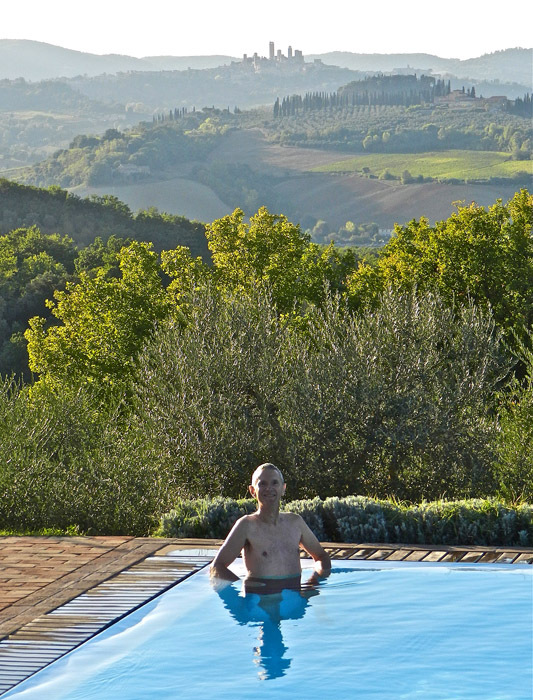 Don in the pool with San Gimignano in the distance. 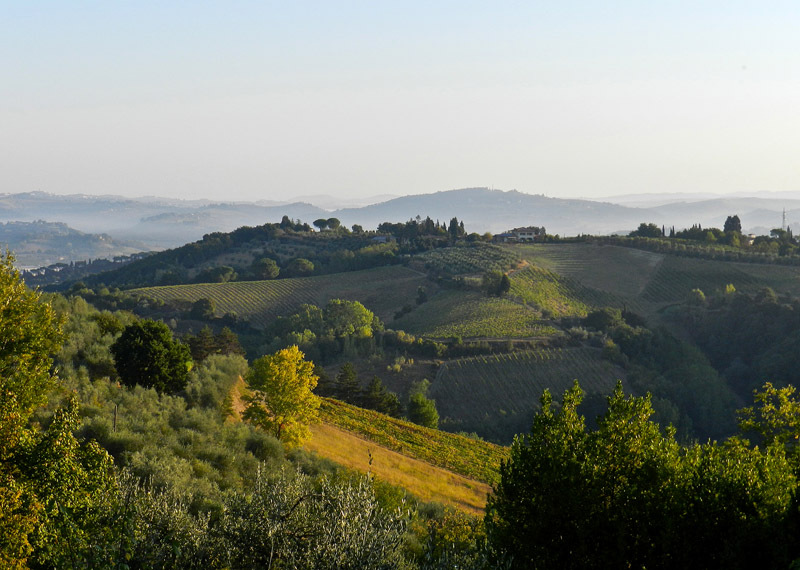 I hardly know where to start with Tuscany, we’ve done and seen so much in the last ten days. 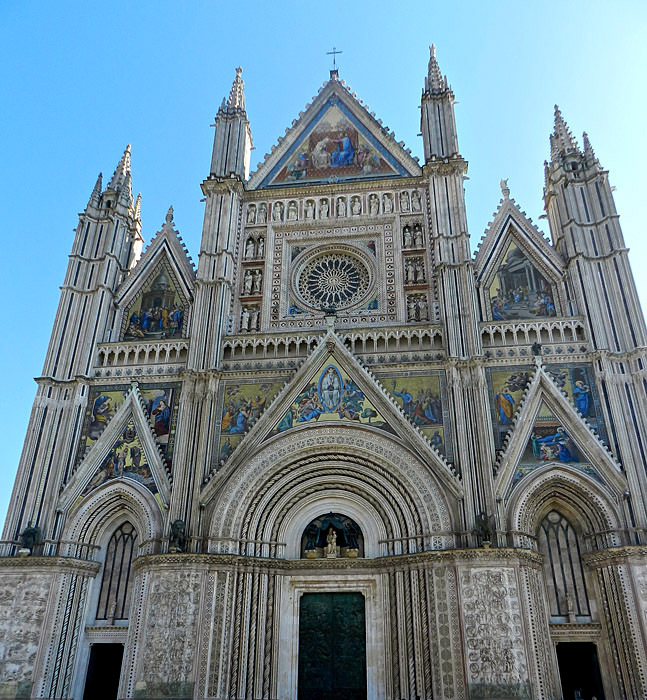 We’ve been to Firenze, Siena, San Gimignano, Volterra, Cecina on the coast, and Orvieto in Umbria. And now feel as if I have a better understanding of the extravagance of the art in the Temples of Humankind at Damanhur (www.thetemples.org, click on virtual tour). They are the modern equivalent. 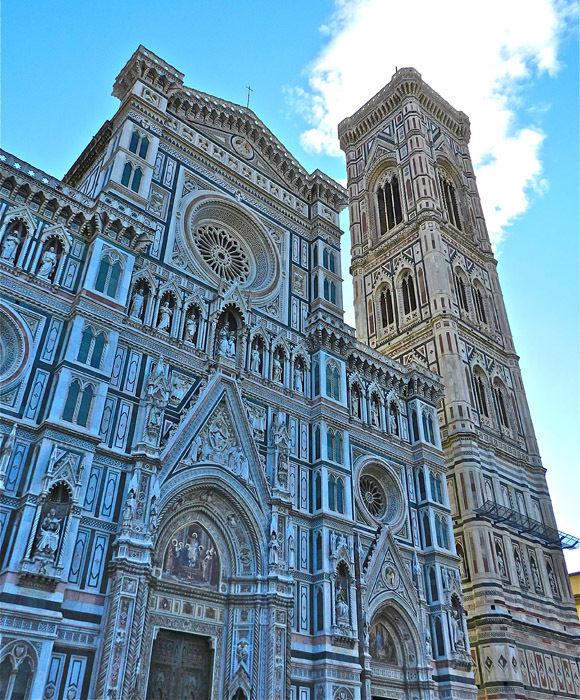 Italians are raised surrounded by art, most of it glorious and beautiful and ornate and extravagant and wonderfully over the top. 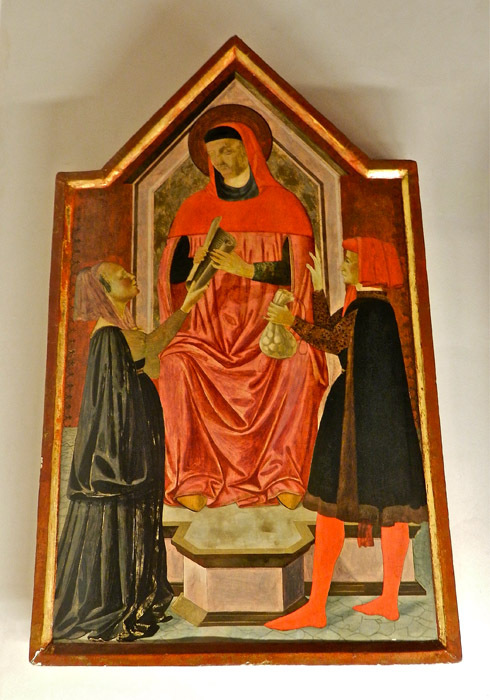 I saw some 13th and 14th century religious art in the Uffizi Gallery in Florence that took my breath away with it’s beauty. And gladly stood in front of Botticelli’s Birth of Venus and Primavera in time out of time finally able to absorb them in a way that’s not possible looking at a reproduction in a book. It was so fulfilling to finally see the real thing. 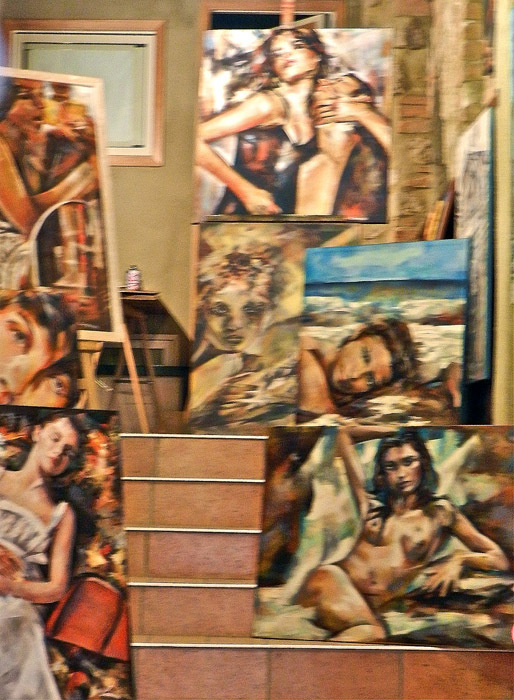 And there were crowds around so I had to invent a way to see these paintings without people blocking some or all of it. 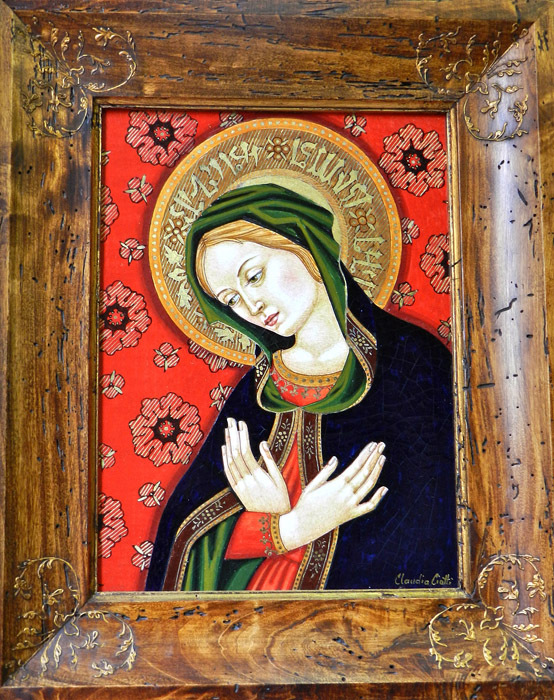 Why do people look at large paintings from three feet away? Don’t they realize that large paintings are best seen from a distance where the eye can take it all in? Anyway I went right to the front and squatted down holding on to the railing that was about three feet in front of the painting, and just stayed there. For several minutes. Just squatting down, not blocking anyone’s view, not moving. And then when I felt the time was right I stood, with my arms wide and moved slowly backwards. Miraculously the crowd had melted away, and in this way I got to see both Botticelli’s without anyone blocking my view. Sweet victory. 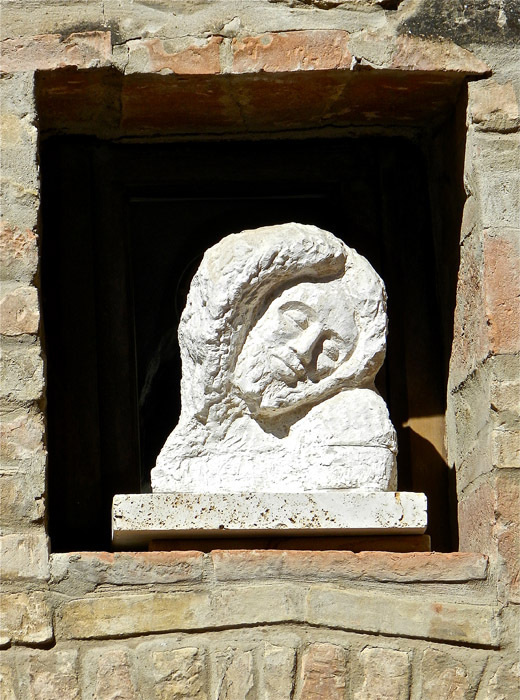 Although I learned a lot in school about much of what I’m seeing, Donatello and Ghiberti and Michaelangelo and Brunelleschi and Giotto, and although I did visit Italy briefly in my early thirties, I didn’t, or couldn’t appreciate it then the way I can now. I feel full with the beauty of art, and of the infinite and astonishing creativity of humankind. So much fun! I myself prefer the lamp ladies in the back of the store! 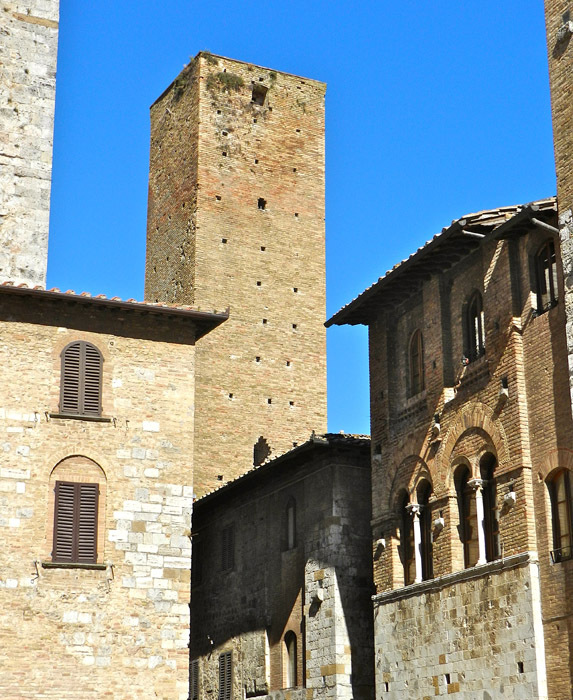 San Gimignano was our first foray into the hill towns of Tuscany. It was a good place to start being close to “home”, easy to find, and completely fascinating. Like Cinque Terre it too was full of tourists and it was easy to see why. 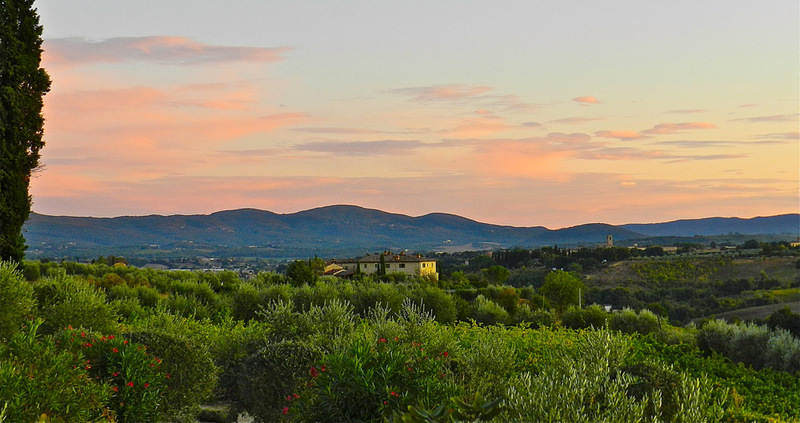 If you come to Tuscany you’d be mad to miss it. 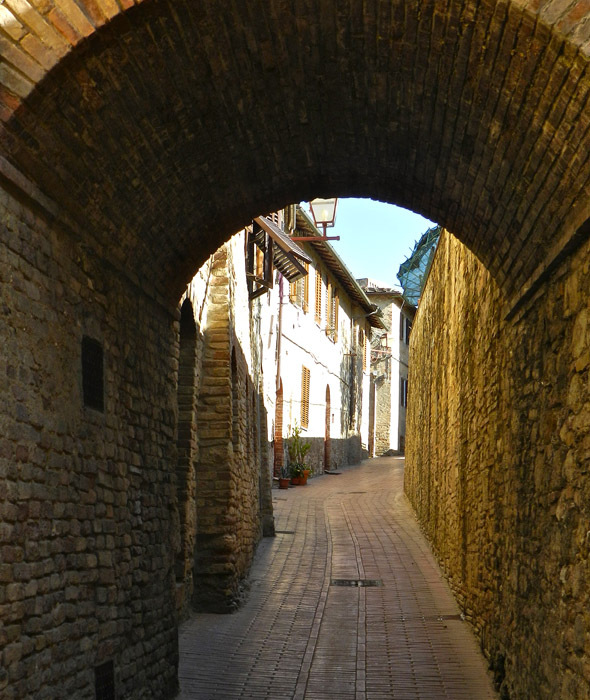 It’s a walled medieval hill town and a wonderful example of medieval architecture. We walked around for hours completely enthralled. 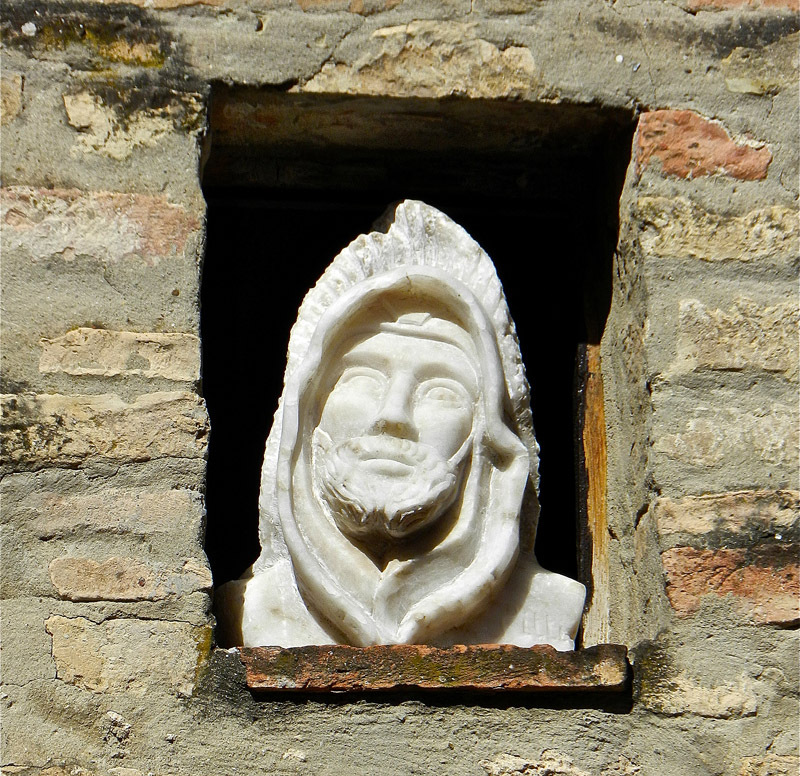 Both these sculptures were in niches on the outside wall of a house. We found the international award winning gelato place. Twice. 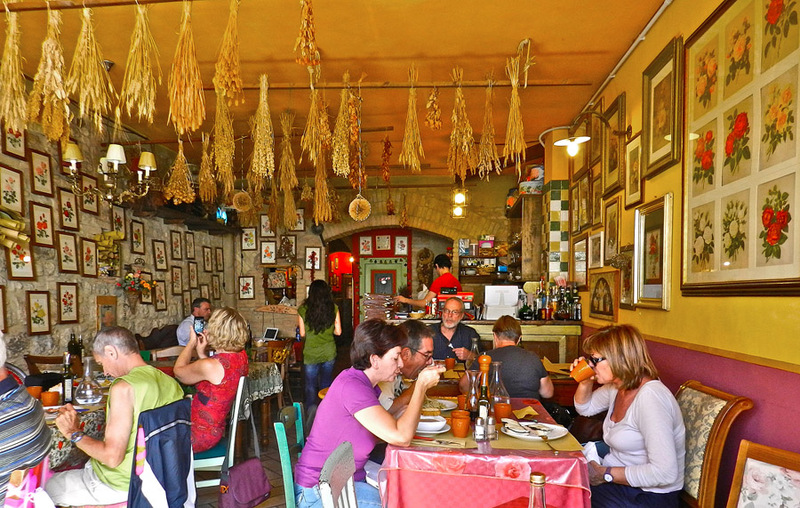 And had lunch at a lovely restaurant that had pictures of roses covering all the walls. The food was excellent. Don’s pizza was great of course, and I had the best salad since coming to Italy. 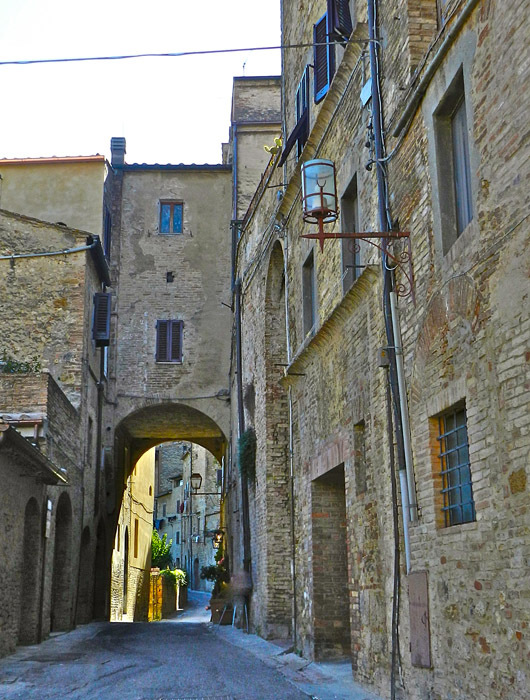 San Gimignano is utterly charming, and in spite of the large numbers of tourists, largely unspoiled. I’m just soaking up the sense of history here that all Europeans grow up with. Being Australian/Canadian, where there’s nothing much that’s really old, I’m completely captivated by it all. And there was a busker, in a garden with trees, high up on top of one part of the walls of the town where you can get a great view of the surrounding countryside. She had a lovely rich clear voice and sang beautiful etherial songs, so we sat on the grass and listened for a while to this unexpected musical treat. And then Don and Ruth spent a long time deciding on which bottle of local wine to buy for dinner, and we went back to our little villettea on the farm and made a wonderful meal to have with it. 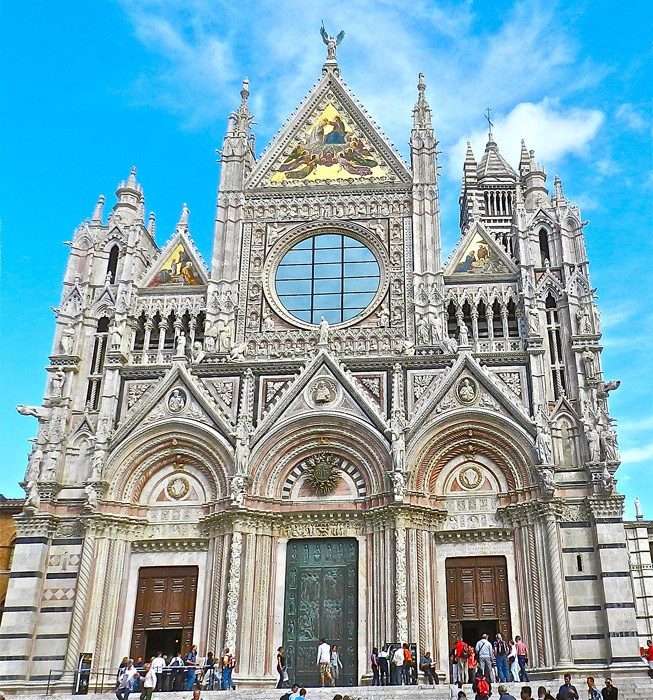 Next post – Florence, Siena, and assorted towns of Tuscany. Thank you so much, I’m glad you’re enjoying reading about your home land. 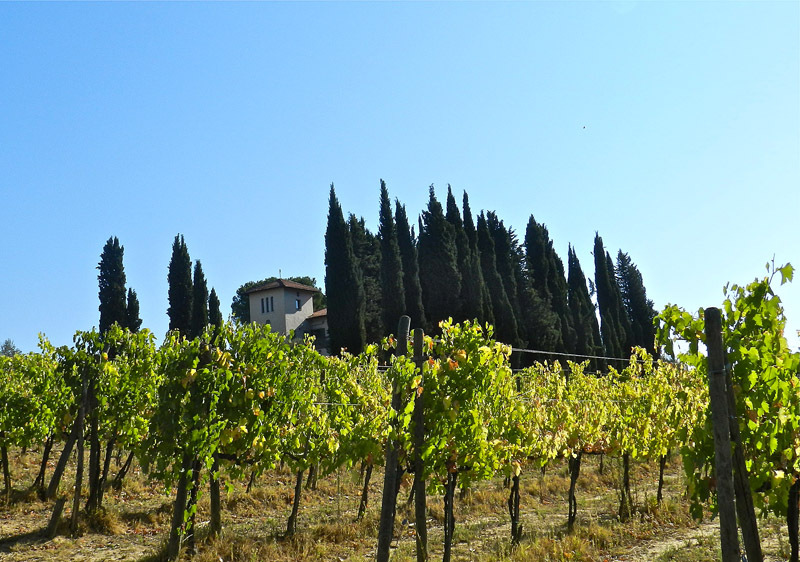 We loved Tuscany. Well, we loved everywhere we went in Italy. Such a beautiful country! 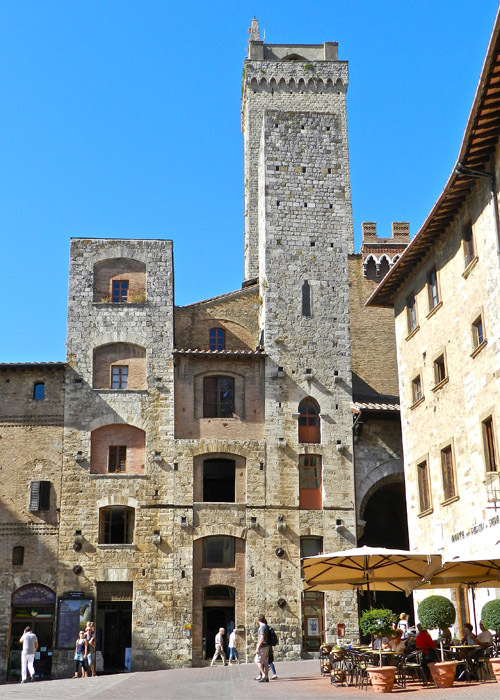 We adored San Gimignano, and all of Tuscany. 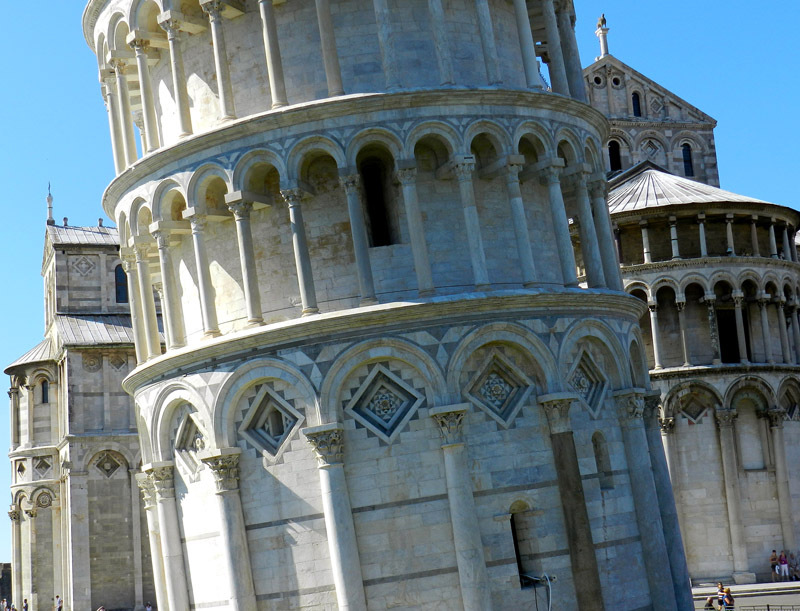 We loved Italy and will probably return one day. It’s a beautiful country. 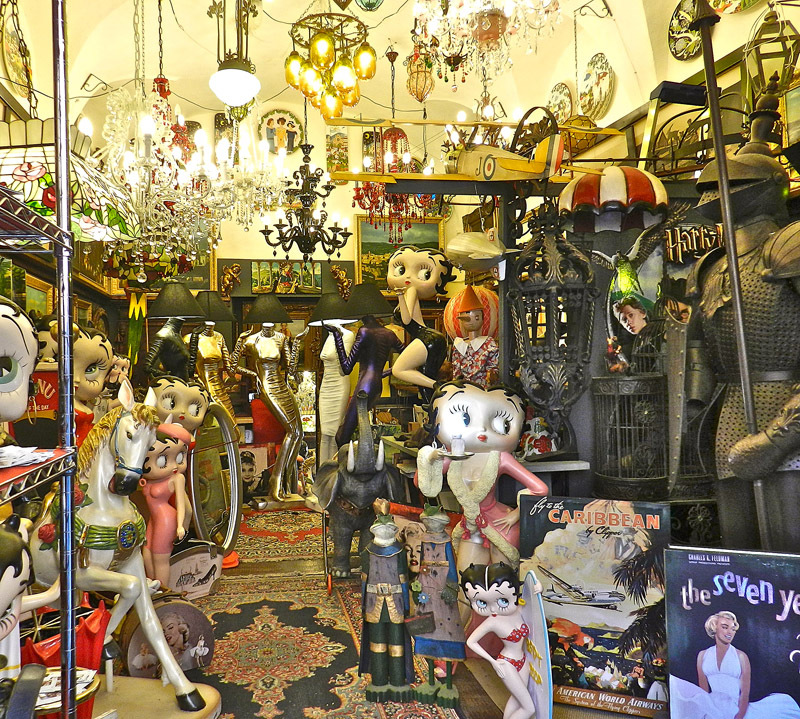 Thanks for the link to La Verna, it looks like a wonderful place!